Does JVM create object of Main class (the class with main())? Is main method compulsory in Java? boolean: boolean data type represents only one bit of information either true or false . Values of type boolean are not converted implicitly or explicitly (with casts) to any other type. But the programmer can easily write conversion code. byte: The byte data type is an 8-bit signed two’s complement integer. The byte data type is useful for saving memory in large arrays. short: The short data type is a 16-bit signed two’s complement integer. Similar to byte, use a short to save memory in large arrays, in situations where the memory savings actually matters. Note: In Java SE 8 and later, we can use the int data type to represent an unsigned 32-bit integer, which has value in range [0, 232-1]. Use the Integer class to use int data type as an unsigned integer. long: The long data type is a 64-bit two’s complement integer. Note: In Java SE 8 and later, you can use the long data type to represent an unsigned 64-bit long, which has a minimum value of 0 and a maximum value of 264-1. The Long class also contains methods like compareUnsigned, divideUnsigned etc to support arithmetic operations for unsigned long. 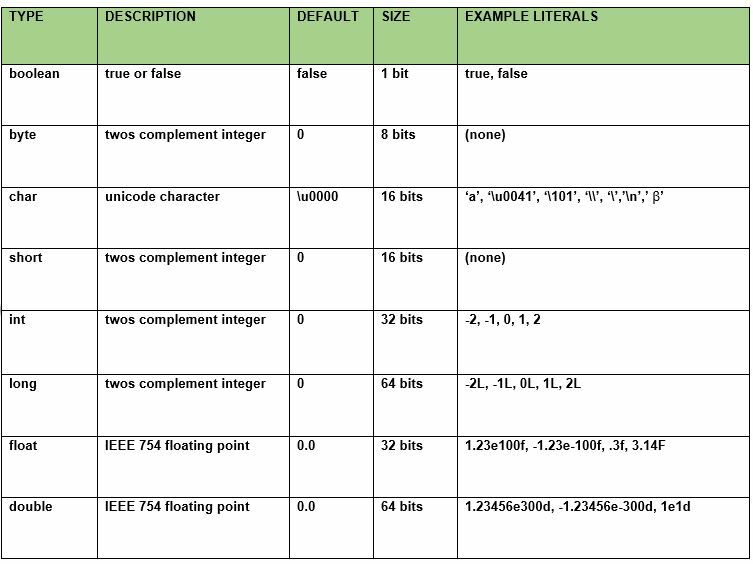 float: The float data type is a single-precision 32-bit IEEE 754 floating point. Use a float (instead of double) if you need to save memory in large arrays of floating point numbers. double: The double data type is a double-precision 64-bit IEEE 754 floating point. For decimal values, this data type is generally the default choice. Note: Both float and double data types were designed especially for scientific calculations, where approximation errors are acceptable. If accuracy is the most prior concern then, it is recommended not to use these data types and use BigDecimal class instead. This article is contributed by Shubham Agrawal. If you like GeeksforGeeks and would like to contribute, you can also write an article using contribute.geeksforgeeks.org or mail your article to contribute@geeksforgeeks.org. See your article appearing on the GeeksforGeeks main page and help other Geeks.